I am more concerned with what we aren’t talking about. From what I gather from all the news reports I’ve read and the ESPN coverage I watched, is that Donald Sterling, an incredibly powerful white racist, was telling his mistress (i.e. they’re not married) who she could and could not hang with, particularly at the games. He didn’t want her bringing any black people to the games. Let me break it down a little differently. Old, powerful white man with lots of money wants to control the behavior of the young lady he sleeps with. Let me say it a little more boldly: sugar daddy with money seeks to control the actions of the woman who meets his physical needs. That isn’t love. Sexism and the abuse of power. Why aren’t we talking about the fact that an 80 year old married man has a mistress who financially benefited from their arrangement? Why aren’t we asking deeper questions about why an 80 year old man with a lot of money believes it is alright to try and control her behavior? Sterlings racism has been publicly obvious for years. It is offensive. The double standard of his racism (his mistress is of mixed race – whatever that means) is offensive. His sexism, however, has subtly gone unchecked. Are we ignoring the implications of an 80 year old married man sitting court side with his lover who is less than half his age? What signal does that communicate to the young ladies in our culture today? When watching the games on tv and they zoom in on the owner with his girlfriend, do we with our sons about why unfaithfulness in marriage isn’t something to be celebrated? Do we remind our daughters in that moment of how beautiful they are? Are we ignoring the fact that he wants to control her interactions with others? Are we ignoring the fact that in any other setting we would call that sexism and an abuse of power? What a great opportunity to have a conversation about how we can use the resources God has given us to bring restoration to our world rather than pursuing our never ending appetites. All over the world there are men who are trying, and are too often successful, to control the behavior of women. 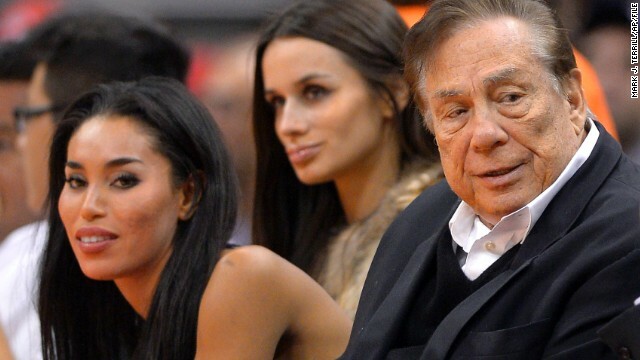 When the tapes of Sterling’s conversation became public, what struck me most wasn’t the racist remarks. It was the fact that he thought that because she was his mistress he should be in control of her behavior. I don’t want this for my daughter. I don’t want this for my sons.